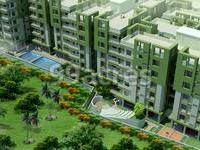 Saket Nagar is a residential development of Saket Promoters. Located in the midst of Dunlop, Kolkata, it is built across a wide area. These luxurious 2BHK and 3BHK housing units make it a dream home to everyone. These apartments are beautifully crafted with basic amenities. Where is Saket Nagar located? Dunlop, a prime residential locality for house seekers in Kolkata North. What is the area of apartments in Saket Nagar? The area of apartments offered in the project ranges from 875.0 sqft to 1462.0 sqft. 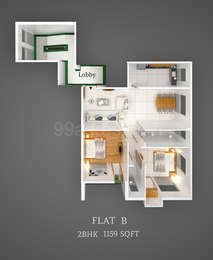 How much is area of 2bhk in Saket Nagar? 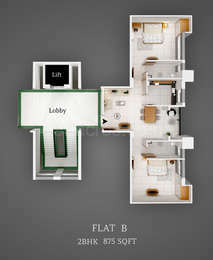 Two-room units (2BHK) in the project are available in an area of 875.0 sqft to 1159.0 sqft. What is the 3 bedroom size in Saket Nagar? 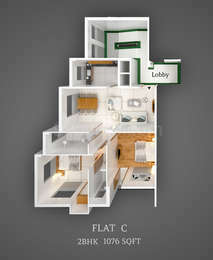 The area of 3BHK units in the project varies from 1156.0 sqft to 1462.0 sqft. How much is the total size of Saket Nagar?The project is spread over an area of 1.2 Acres. How many units are available in Saket Nagar?The project has a total of 153 units. Established over 10 years ago, Saket Promoters is a notable developer in the real estate sector of Kolkata. Set up with a vision to offer quality living structures at affordable prices; the group has been working dedicatedly to achieve this. Apart from this, it aims to convert the dreams of the people for a perfect home into reality. The group has managed to develop a loyal base of customers because of its beautiful architectural designs. Saket Arient, Saket Pearl, Saket Dakkhin Kali and Saket Sadan are some of its developments in the city. Want to buy 3bhk, Please provide price range.